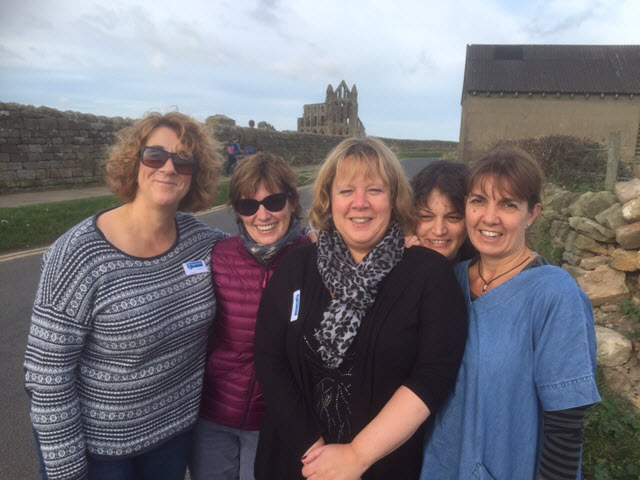 On Thursday 27th October, the Brigantes Office Team set off on a road trip to encompass much of the Northern area of England covered by Brigantes Walking Holidays in two and a bit days. The first day saw us leaving our homes in Wharfedale and Malhamdale, through Pateley Bridge and on to Ripon. The idea was to meet as many of the accommodation providers we use as possible, hopefully find some which we didn’t know existed, get a feel for the areas we service, and the quality of the accommodations, and put faces to names of the accommodation providers. We wanted to show them what a happy and friendly bunch we are! From Ripon we travelled through to Thirsk and then took a detour to Byland Abbey, via Kilburn (Cleveland Way), where we found two B&Bs we didn’t know existed, venturing on to the Byland Abbey Inn (on the Whitby Way) for a lovely cup of coffee and piece of cake. The lovely proprietors showed us around the property, the rooms were idyllic, full of character and history, and the view from the windows were directly onto the Abbey. Though the property is no longer an inn, and closes at 5pm, so an evening meal needs to be taken locally, this is an establishment we would (and will) thoroughly recommend. In fact, we all plan to take our respective other halves back there! 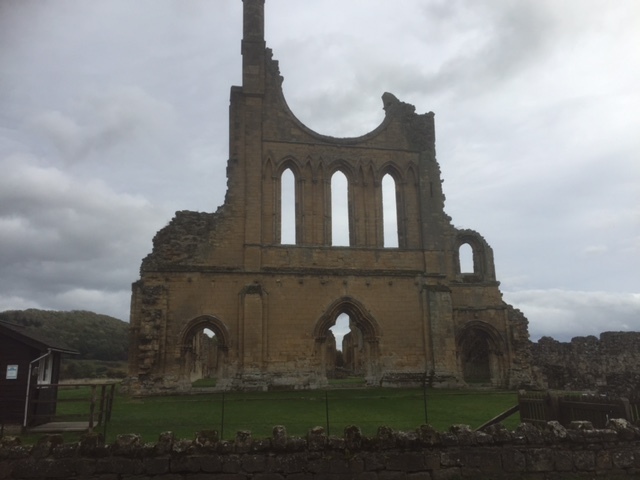 From Byland Abbey we headed further south to drive through Crayke, sadly we didn’t have time to stop at the Durham Ox, or we wouldn’t reach our destination at Robin Hoods Bay until midnight! Heading north again via Wass, we stopped in Helmsley and had lunch at Crema Coffee House, where the owner, Rachel, allows our clients to leave their bags if they are not stopping overnight in Helmsley at the beginning of the Cleveland Way, or at either end of the Inn Way to the North York Moors. We had a lovely lunch, and were thoroughly stuffed by the time we left to head north to Hawnby, then on to Chop Gate, Kilburn and Glaisdale, with a brief stop at Clay Bank Top where the Cleveland Way and Coast to Coast meet. 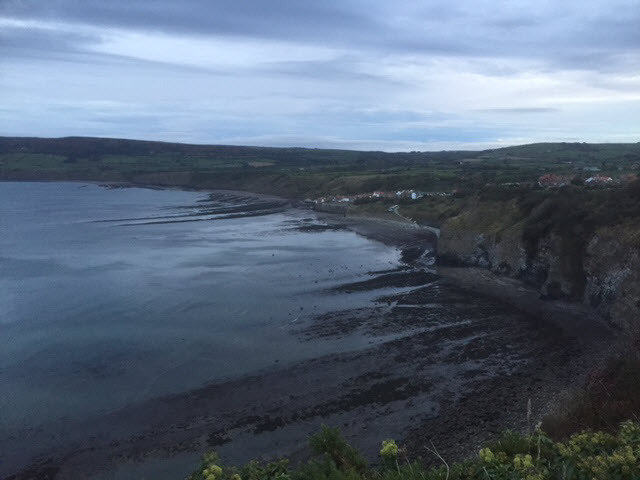 We had hoped to have time to venture back into the centre of the moors to visit our driver, Kathleen, in Rosedale Abbey, but it was getting late, and the coast was beckoning. We finally arrived at our destination for the night, the Victoria Hotel at Robin Hoods Bay, in time for a couple of bottles of prosecco before dinner! After a lovely meal, Sarah, Ria and myself headed for a walk onto the beach, leaving Nicola & Louise to “air” a couple of bottles of wine for our return. We dipped our toes in the sea by moonlight, and headed back to join the others, who were by this time, quite “happy”. After a good night’s sleep, disturbed only by the snoring of our respective bedroom buddies (not mentioning the fact that the twin beds were rather close together and may as well have been doubles! ), we had a slap up breakfast, and headed out into Robin Hoods Bay to make ourselves known with some of the guest house proprietors. I had got up early (it is hard to break a habit of a lifetime) and watched the sun rise over the bay. Our first job for the day was to collect a bag for a last minute client who had called my mobile whilst we were on route, asking if it would be possible for Brigantes to carry his bag from Boggle Hole YHA to Whitby YHA. 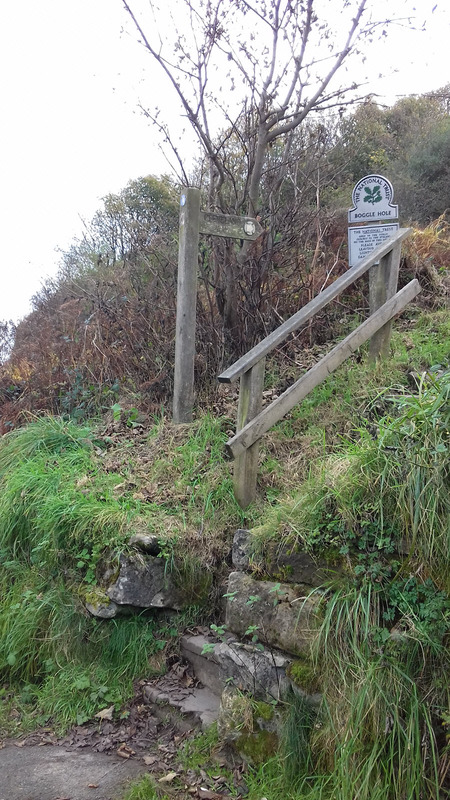 Well, we are known at Brigantes for going the extra mile, so we headed for Boggle Hole, parked the car at the carpark at the top, and walked down to the YHA. What a fantastic place! It was buzzing with people, the café was full, and there were families on the beach. 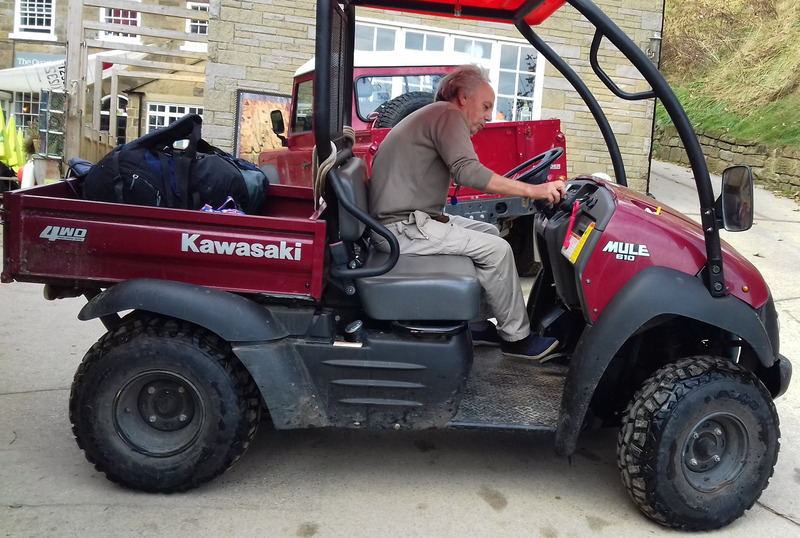 I shrugged the rather heavy rucksack onto my back, and headed for the door, when one of the warden’s stopped us and offered a couple of us and the bag a lift back to the carpark in his mule. Nicola and I accepted gratefully, and though both of us are used to riding around on quad bikes, having done our fair share of farming in the Yorkshire Dales, neither of us had ever ridden on a mule, with a character of a man, who wanted to take us up the hill to the car, and bring us back down again to stay! We wizzed across the beach, sending families scattering and chugged up the steep hill, where we waiting for the others, who were walking off their breakfasts! 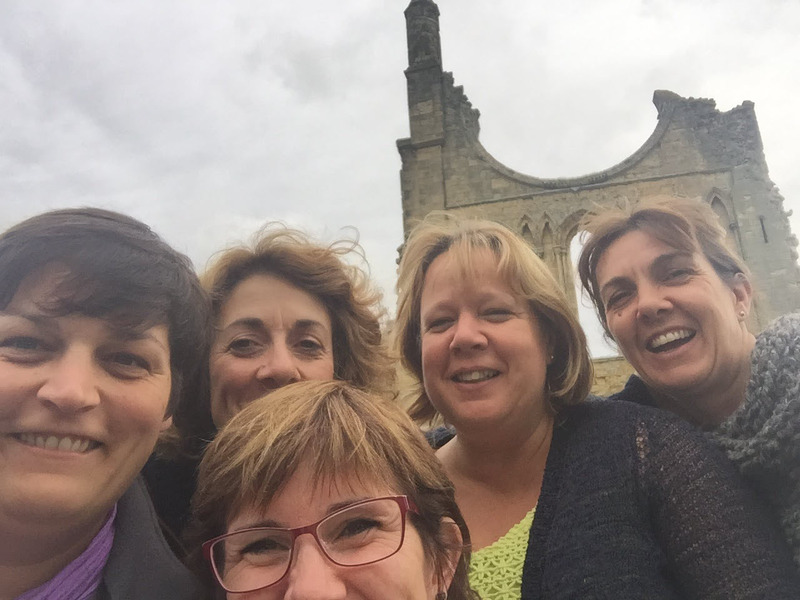 We delivered the clients bag to the YHA at Whitby, and attempted a “selfie” in front of the Abbey, where a sympathetic passer by took pity on our pathetic attempts and took a photo for us! Venturing north up the coast we called in at Runswick Bay for a coffee and cake (this blog seems to feature rather a lot of eating!) and were shown round The Firs Guest House, by the lovely Mandy. Following the coast we passed Staithes, then went to have a look at the Holly Bush Inn at Skelton, which looks to be closed down, and in a sad state, ending up in Saltburn by the Sea, where we called in at a few of the guest houses, and met the owners. I was pleasantly surprised by Saltburn, having never been there before, I’d had an unfair picture of it in my head, which has now been amended. The next part of the journey was a dash up the motorway to Newcastle, where we called in at the Grey Street Hotel, another accommodation provider who have been particularly cooperative over the last year or two, and will allow our clients to leave their bags for us to collect if they aren’t staying in Newcastle overnight prior to their Hadrians Wall trip, or equally we can leave the clients bags there for them to collect when they have finished their walk, if walking from West to East. A really handy service, as the hotel is close to the railway. I didn’t go in the hotel, as was driving and there was no-where to park, but the others said it was a good, clean hotel, quite modern, so one we will be continuing to use in the years to come. We were beginning to run out of time to get everything done in the day that we had hoped, so instead of driving along the Roman Road to Heddon on the Wall, we headed straight up the A696 through Ponteland to Kirkwhelpington, calling in at the Knowesgate Inn, and onward through Otterburn to Byrness, where we were shown round Forest View Inn and the Bunkbarn by Joyce, before calling in to see our driver, Kate who had lost her dad the week before, but she was as smiley and bubbly as ever, and made a mean cup of coffee. From Byrness we set off south again via Bellingham, to meet up with the Roman wall, and West to Gilsland where we were booked in at Bush Nook Guest House for the night. Malcolm was there to meet us, and you couldn’t have ask for a friendlier, more informative host, he’s a font of knowledge. We drove down to the Samson Inn for dinner, which was delicious, and headed back to Bush Nook. Malcolm didn’t have any other guests in that night, so insisted we took a room each, so there was no snoring disturbance that night! As ever I got up early and had a walk (in the dark) on a riverside path, and by the time I got back the others were up and about and seated for breakfast. Breakfast was enormous and fabulous, we couldn’t eat it all. We all agreed that this was another place we would come back to with our spouses. There is no wonder our clients enjoy their stays so much at Bush Nook. The next day was our last of the “Brigantes Tour” and on leaving Malcolm and his wonderful hospitality, we drove into Greenhead. The hotel was closed but we had a peek through the windows and dropped some brochures through the door, before heading up a small track to find Holmhead Guest House, which is on the path of the Pennine Way, and met Alan, the proprietor. He couldn’t show us round as he had a house full of family, but we had a nice chat, and again it was nice to put a face to the name. Leaving Greenhead, we started our journey back south, and called in at Kellah Farm, which is a strategic stopping place on the Pennine Way, now that the B&B in Slaggyford is no longer in operation. The owners of Kellah Farm are farmers, and we had a chat with them, with them showing us where the Pennine Way comes in close to their property. On leaving them, we took what we thought was the right road, but ended up at a huge sewage works, so had to turn back and retrace our steps! We finally got to the road we needed and called in at Blenkinsopp Castle, where they also offer guest accommodation just south of Haltwhistle. Passing through Knarsdale and Slaggyford, we entered Alston and split to make ourselves known at Alston House and the Cumberland Inn, before travelling on to Garrigill, where our driver Bob, and his partner Margaret just happened to be on the green chatting to some neighbours so the Nicola and Louise got to meet them for the first time. The George & Dragon in Garrigill has shut down (again) so we split the group, with a couple of us going to meet Lana at East View, which we use all the time, and the other three going to have a look at St John’s House which has a swimming pool and jacuzzi and will be looking to offer evening meals next year. Leaving Garrigill we headed down Teesdale via Langdon Beck Hotel and High Force Hotel, to have lunch at one of my all time favourite cafes, 1618 in Middleton in Teesdale (sadly for sale), making ourselves known at a few of the B&Bs in Middleton. Onwards to Swaledale via Tan Hill and Keld, over Buttertubs Pass to Hawes, then onto Ribblehead, Horton, Settle and back home to Wharfedale. An epic adventure, fully enjoyed by all of us. We look forward to our next trip! Previous PostPrevious The Whitby What?… The Whitby Way!